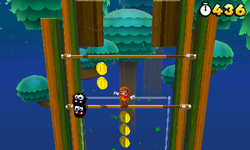 World 7-3 is the third level of World 7 in Super Mario 3D Land. Seventy Star Medals are needed to unlock this level. In a dark tree level based on tightropes, Mario needs to navigate up a tree by tightropes while avoiding Fuzzies then jump in a warp box to get to another tree and do the same. After he hop into the next warp box, Mario is taken to the third and final tree. The player needs to avoid Fuzzies and reach to the flagpole. However, a huge shortcut requiring Tanooki Mario or Statue Mario is present in the stage. Star Medal 1: The first medal can be found on the tightrope right above the four Fuzzies at the beginning of the level. Star Medal 2: The player should hit the purple blocks to move them so that they can be able to reach the Rainbow Jump Block. This will transport the player to a Coin Heaven and the next medal. Star Medal 3: Near the end of the level, this medal can be obtained by jumping off the tightropes while avoiding the Fuzzies.